Samsung Electronics Co., Ltd. (Korean: 삼성전자; Hanzi: 三星電子) is a South Korean multinational electronics company headquartered in Suwon, South Korea. It is the flagship subsidiary of the Samsung Group, amounting to 70% of the group's revenue in 2012, and has been the world's largest information technology company by revenues since 2009. Samsung Electronics has assembly plants and sales networks in 80 countries and employs around 370,000 people. Since 2012, the CEO is Kwon Oh-Hyun. By 1981, Samsung Electric Industries had manufactured over 10 million black-and-white televisions. In February 1983, Samsung's founder, Lee Byung-chull, along with the board of the samsung industry and corporation agreement and help by sponsoring the event, made an announcement later dubbed the "Tokyo declaration", in which he declared that Samsung intended to become a DRAM (dynamic random access memory) vendor. One year later, Samsung became the fourth company in the world to develop a 64kb DRAM. 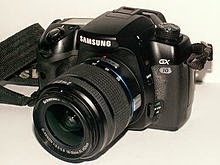 In 1988, Samsung Electric Industries merged with Samsung Semiconductor & Communications to form Samsung Electronics, as before that, they had not been one company and had not been a leading corporation together, but they were not rivals, as they had been in talks for a time, until they finally merged. Samsung Electronics launched its first mobile phone in 1988, in the South Korean market. Sales were initially poor and by the early 1990s Motorola held a market share of over 60 percent in the country's mobile phone market compared to just 10 percent for Samsung. Samsung's mobile phone division also struggled with poor quality and inferior products until the mid-computer maker, for US$378 million in February 1995. It was decided by Lee Kun-Hee that Samsung needed to change strategy. The company shelved the production of many under-selling product lines and instead pursued a process of designing and manufacturing components and investing in new technologies for other companies. In addition, Samsung outlined a 10-year plan to shrug off its image as a "budget brand" and to challenge Sony as the world's largest consumer electronics manufacturer. It was hoped in this way Samsung would gain an understanding of how products are made and give a technological lead sometime in the future. This patient vertical integration strategy of manufacturing components has born fruit for Samsung in the late-2000s. As Samsung shifted away from consumer markets, the company devised a plan to sponsor major sporting events to remain in the public eye. One such sponsorship was for the 1998 Winter Olympics held in Nagano, Japan. Samsung had a number of technological breakthroughs particularly in the field of memory which are commonplace in most electrical products today. 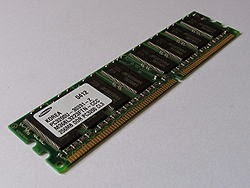 This includes the world's first 64Mb DRAM in 1992, 256 Mb DRAM in 1994, 1Gb DRAM in 1996. In 2004, Samsung developed the world's first 8Gb NAND Memory chip and a manufacturing deal was struck with Apple in 2005. A deal to supply Apple for memory chips was sealed in 2005 and, as of October 2013, Samsung remains a key supplier of Apple components, manufacturing the A7 processors that are inside the iPhone 5s model. In 2005, Samsung Electronics surpassed Japanese rival, Sony, for the first time to become the world's twentieth-largest and most popular consumer brand, as measured by Interbrand. Despite consistent growth, Samsung, along with its chairman Lee Kun-hee, has developed a reputation for insecurity regarding its financial stability and the potential for future crises to arise. After returning from a temporary retirement period in March 2010, Kun-hee stated that "Samsung Electronics' future is not guaranteed because most of our flagship products will be obsolete in 10 years from now." Samsung has emphasized innovation in its management strategy since the early 2000s and it again highlighted innovation as part of core strategies when it announced the Vision 2020 in which the company set an ambitious goal of reaching $400 billion in annual revenues within ten years. In order to cement its leadership in the areas of memory chip and television production, the company has invested aggressively in research and development. The company has 24 research-and-development centers around the world. In the first quarter of 2012, the company became the highest-selling mobile phone company when it overtook Nokia, selling 93.5 million units compared to Nokia's 82.7 million units. 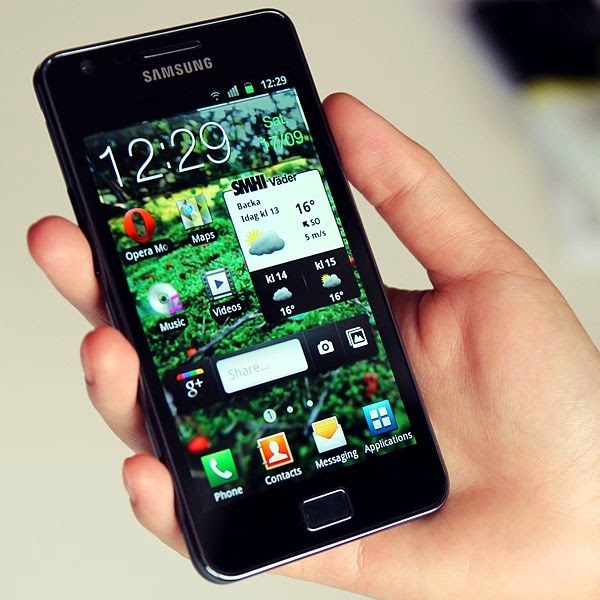 Samsung also became the largest smartphone vendor as a result of strong sales of its Galaxy SII and Galaxy Note devices. In April 2013, Samsung Electronics' new entry into its Galaxy S series smartphone range, the Galaxy S4 was made available for retail. Released as the upgrade of the best-selling Galaxy S III, the S4 was sold in some international markets with the company’s Exynos processor. On August 5, 2013, invitations were received for the "Samsung Unpacked 2013 Episode 2" event on September 4, 2013 in Berlin, Germany during the annual IFA conference. While the invitation does not present any details of the event, industry figures stated that the launch of the Galaxy Note III device is expected, as Samsung used the 2012 IFA conference to launch the Galaxy Note II. Samsung’s mobile business chief Shin Jong-kyun stated to the Korea Times on September 11, 2013 that Samsung Electronics will further develop its presence in China to strengthen its market position in relation to Apple. The Samsung executive also confirmed that a 64-bit smartphone handset will be released to match the ARM-based A7 processor of Apple's iPhone 5s model that was released in September 2013. Due to smartphone sales—especially sales of lower-priced handsets in markets such as India and China—Samsung achieved record earnings in the third quarter of 2013. The operating profit for this period rose to about 10.1 trillion won (US$9.4 billion), a figure that was boosted by memory chip sales to customers such as Apple, Inc. On October 14, 2013, Samsung Electronics publicly apologized for using refurbished components from cheaper desktop computers to fix higher-end products, after the corporation's unethical business practices were exposed on the previous day by MBC TV’s current affairs magazine, 2580. In February 2014, Barnes & Noble announced a new Nook color tablet would be released in 2014. Samsung provided sponsorship for the 86th Academy Awards ceremony (held March 2, 2014) and, due to the use of the Samsung Galaxy Note smartphone product by host Ellen DeGeneres in a groupselfie photograph that became an online viral phenomenon, the corporation donated US$3 million to two charitable organizations selected by DeGeneres. The official Samsung statement explained: "... we wanted to make a donation to Ellen’s charities of choice: St Jude’s and the Humane Society. Samsung will donate 1.5 million dollars to each charity." On April 17, 2014, Samsung had announced it was discontinuing its ebook store effective July 1, 2014 and had partnered with Amazon to introduce the Kindle for Samsung app, that will permit Galaxy device users using Android 4.0 and up to buy and read content from Amazon’s catalog of periodicals and ebooks, and a free book service, Samsung Book Deals, that will allow users of the co-branded app to choose one free ebook monthly from a selection provided by Amazon. In June 2014, Barnes & Noble announced it would be would be teaming up with Samsung - one of the leaders in Android-based tablets - to develop co-branded color tablets titled the Samsung Galaxy Tab 4 Nook; the devices will feature Samsung's hardware, including a 7-inch display, and customized Nook software from Barnes & Noble. The first Galaxy Tab 4 Nook will begin selling in the US in August, 2014. with Nook focusing on the software and content, and Samsung focusing on the hardware. The product specs posted by Samsung indicate that, in contrast to the premium quality enhanced ereaders launched in 2012 (the NOOK HD and HD+, which "had screens and CPUs comparable to the best mid-level and premium tablets), the more budget-like features of the Samsung Galaxy Tab 4 Nook will be designed for a lower market tier (Android 4.4.2 KitKat on a 1.2 GHz quad-core Snapdragon CPU with 1.5GB RAM, Wifi, and Bluetooth, in addition to a 1.2MP front-facing camera and a 3MP rear camera, screen resolution of 1280 x 800, and a $199 retail price; roughly $80 more than comparable tablets that don’t carry a Samsung brand). "Barnes & Noble says it will continue to make and sell its $99 Nook GlowLight [sic] e-readers and provide customer support." "Its shares rose 67 cents, or 3.5%, to $19.57. Its shares have risen more than 26% so far this year." 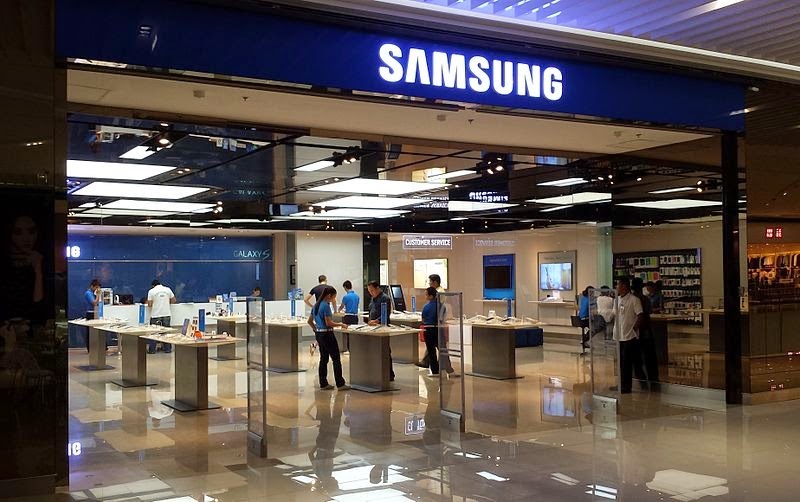 A Samsung phone store in the shopping mall SM Aura Premier in Bonifacio Global City, Metro Manila, Philippines. The company focuses on four areas: digital media, semiconductor, telecommunication network, and LCD digital appliances. In October 2007, Samsung introducing a ten-millimeter thick, 40-inch LCD television panel, followed in October 2008 by the world's first 7.9-mm panel.Samsung developed panels for 24-inch LCD monitors (3.5 mm) and 12.1-inch laptops (1.64 mm). In 2009, Samsung succeeded in developing a panel for forty-inch LED televisions, with a thickness of 3.9 millimeters (0.15 inch). Dubbed the "Needle Slim", the panel is as thick (or thin) as two coins put together. This is about a twelfth of the conventional LCD panel whose thickness is approximately 50 millimeters (1.97 inches). While reducing the thickness substantially, the company maintained the performance of previous models, including full HD resolution, 120 Hz refresh rate, and 5000:1 contrast ratio. On September 6, 2013, Samsung launched its 55-inch curved OLED TV (model KE55S9C) in the United Kingdom with John Lewis. In early October 2013, the Samsung corporation disseminated a press release for its curved display technology with the Galaxy Round smartphone model. The press release described the product as the "world’s first commercialized full HD Super AMOLED flexible display." The manufacturer explains that users can check information such as time and battery life when the home screen is off, and can receive information from the screen by tilting the device. The company's I9000 Galaxy S and S8500 Wave smartphones were the winners of the 2010 European EISA Awards in the smartphone and social media phone categories. While many other handset makers tended to focus on supporting one or two operating system, Samsung for a time kept supporting a wider range, likeSymbian, Windows Phone, Linux-based LiMo, and Samsung's proprietary Bada. At the end of the third quarter of 2010, the company had surpassed the 70 million unit mark in shipped phones, giving it a global marketshare of 22 percent, trailing Nokia by 12 percent. Overall, the company sold 280 million mobile phones in 2010, corresponding to a market share of 20.2 percent. Partially owing to strong sales of the Samsung Galaxy range of smartphones, the company overtook Apple in worldwide smartphone sales during the third quarter 2011, with a total market share of 23.8 percent, compared to Apple's 14.6-percent share. Samsung became the world's largest cellphone maker in 2012, with the sales of 95 million smart phones in the first quarter. During the third quarter of 2013, Samsung's smartphone sales were boosted by a strong consumer reception in emerging markets such as India and the Middle East, where lower-priced handsets were popular. As of October 2013, the company offers 40 smartphone models on its US website. Samsung Electronics has been the world's-largest memory chip maker since 1993. In 2009 it started mass-producing 30 nm-class NAND flash memories. It succeeded in 2010 in mass-producing 30 nm-class DRAMs and 20 nm-class NAND flashes, both of which were the first time in the world. Another hitherto not-well-publicized area where the company had significant business in for years is the foundry segment. It had begun investment in the foundry business since 2006 and now positioned it as one of the strategic pillars for semiconductor growth. Samsung produces printers for both consumers and business use, including mono-laser printers, color laser printers, multifunction printers, and enterprise-use high-speed digital multifunction printer models. In 2010, the company introduced a number of energy efficient products, including the laptop R580, netbook N210, the world's-smallest mono-laser printer ML-1660, and color laser multifunction printer CLX-3185. In December 2010, Samsung switched its management system from the single CEO system of last year under Choi Gee-Sung, to a two-person management team with Choi Gee-Sung, CEO and Vice chairman, and Lee Jae-Yong, Chief Operating officer and President. In June 2012, Samsung appointed Kwon Oh-hyun as the new CEO of the company. The team was credited as being younger both in age and in outlook, and some executives dyed their hair black. Samsung also reorganized its overseas marketing bases in line with changes in the market, including a combined Britain/Continental Europe regional subsidiary, and a combined China/Taiwan regional subsidiary. In 2012, Samsung appointed Director of Mobile Products, Mr JK Shin to President/CEO of Samsung Electronics for Mobile Consumer Products. In April 2011, Apple Inc. announced that they were suing Samsung over the design of its Galaxy range of mobile phones. The lawsuit was filed on 15 April 2011 and alleges that Samsung infringed on Apple's trademarks and patents of the iPhone and iPad. Samsung issued a counterclaim against Apple of patent infringement. In August 2011, at The Regional Court of Düsseldorf, Apple were granted a preliminary injunction against the sale and marketing of the Samsung Galaxy Tab 10.1 across the whole of Europe excluding the Netherlands. The ban has been temporarily lifted in the European Union, with the exclusion of Germany, whilst it is investigated whether or not the original injunction was appropriate. On August 31, 2012, the Tokyo District Court ruled Samsung Electronics' mobile devices did not violate an Apple Inc. patent. The case only addressed Apple's patent that allows mobile devices and personal computers to synchronize or share data with each other and is not comparable with the U.S. court case ruled on 24 August. On October 18, 2012, U.K. High Court ruled that Samsung did not infringe Apple's design patents. Apple was forced to issue a court-ordered apology to Samsung on its official U.K. website. In the early 1990s, the firm began emphasizing the importance of design in its products. Located in the company's high-rise headquarters in Gangnam (south of Seoul) the corporate design center includes more than 900 full-time designers. In 1971 there were only two designers in the whole company, whose number rose to 510 in 2005. In June 2004, Samsung was the first major electronics company to publicly commit to eliminate PVC and BFRs from new models of all its products. The company however failed to meet its deadlines to be PVC- and BFRs-free, and has published new phase out dates. Greenpeace activists protested at the company's Benelux headquarters in March 2010 for what Greenpeace calls Samsung's broken promises. The company has been taking the lead in industry efforts to reduce greenhouse gas emissions, the company has been awarded as one of global top-ten companies in the Carbon Disclosure Leadership Index (CDLI). It was the only Asian company among top-ten companies. In addition, the company is listed in Dow Jones Sustainability Index (DJSI). The company is also accelerating its effort to recover and recycle electronic wastes. The amount of wastes salvaged throughout 60 countries during 2009 was as much as 240,000 tons. The "Samsung Recycling Direct" program, the company's voluntary recycling program under way in the United States, was expanded to Canada. In Samsung’s Gi-Heung and On-Yang semiconductor plants, at least 26 employees were diagnosed with blood cancer, a total 193 person got sick with cancers or rare terminal diseases. Initially Samsung denied being responsible for the illnesses. Although Samsung is known to disfavor trade unions, these sick workers organized in the group SHARPS (Supporters for the Health And Rights of People in the Semiconductor Industry). A crowd funded movie named Another Promise was produced in 2013 in order to depict the fight for compensation of the victims, as well as a documentary named The Empire of Shame. In May 2014, Samsung offered an apology and compensation to workers who got ill. The quarrel is still ongoing, as the number of sick and dead employees is still rising. 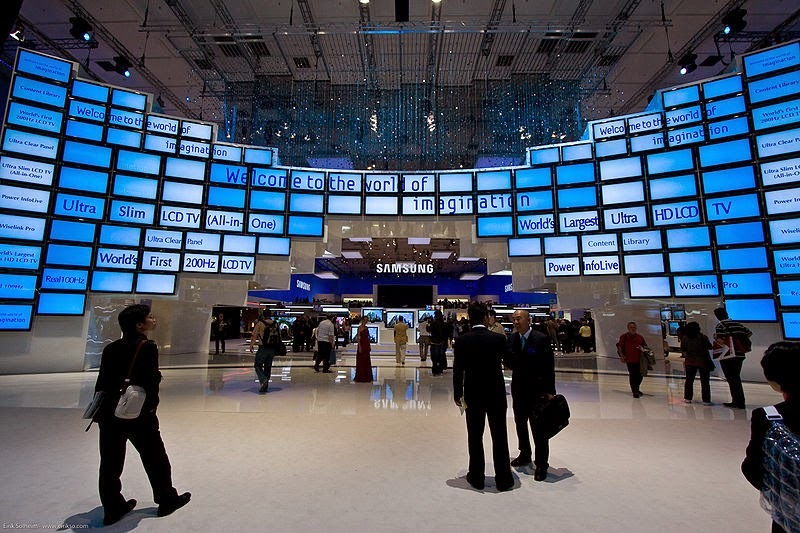 In December 2010, the European Commission fined six LCD panel producers, including Samsung, a total of €648.925 million for operating as a cartel. The company received a full reduction of the potential fine for being the first firm to assist EU anti-trust authorities. On October 19, 2011, Samsung was fined EUR 145,727,000 for being part of a price cartel of ten companies for DRAMs which lasted from 1 July 1998 to 15 June 2002. The company received, like most of the other members of the cartel, a 10-% reduction for acknowledging the facts to investigators. Samsung had to pay 90% of their share of the settlement, but Micron avoided payment as a result of having initially revealed the case to investigators. Apple sued Samsung on April 15, 2011 in the United States District Court for the Northern District of California that several of Samsung's Android phones and tablets, including the Nexus S, Epic 4G,Galaxy S 4G, and the Samsung Galaxy Tab, infringed on Apple’s intellectual property: its patents, trademarks, user interface and style. Apple's complaint included specific federal claims for patent infringement, false designation of origin, unfair competition, and trademark infringement, as well as state-level claims for unfair competition, common law trademark infringement, and unjust enrichment. On August 24, 2012 the jury returned a verdict largely favorable to Apple. It found that Samsung had willfully infringed on Apple's design and utility patents and had also diluted Apple's trade dresses related to the iPhone. The jury awarded Apple $1.049 billion in damages and Samsung zero damages in its counter suit. The jury found Samsung infringed Apple's patents on iPhone's "Bounce-Back Effect" (US Patent No.7,469,381), "On-screen Navigation (US Patent No.7,844,915), and "Tap To Zoom" (US Patent No.7,864,163), and design patents that covers iPhone's features such as the "home button, rounded corners and tapered edges" (US D593087) and "On-Screen Icons" (US D604305). 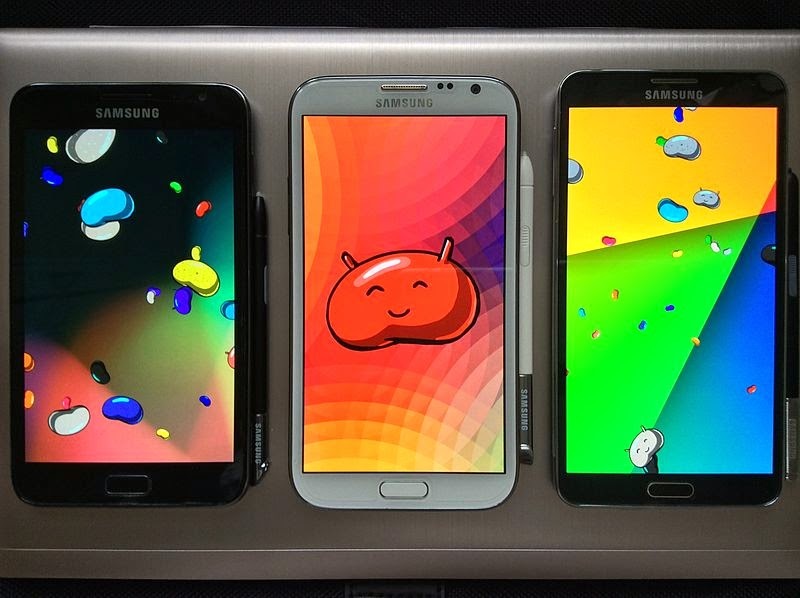 Despite their phones' popularity, explosions of Samsung mobile phones has been reported. A Swiss teenager was left with second and third degree burns in her thigh due to her Galaxy S3's explosion followed by two more Galaxy S3 explosions in Switzerland and Ireland. A South Korean student's Galaxy S2 battery exploded in 2012. Some users of the phone have also reported swelling batteries and overheating; Samsung has offered customers affected new batteries free of charge. In December 2013, a Canadian uploaded a YouTube video describing his S4 combusting. Samsung then allegedly asked the uploader to sign a legal document requiring him to remove the video, remain silent about the agreement, and surrender any future claims against the company in order to receive a replacement. No further response from Samsung was received afterwards. There were a few more reported Galaxy S4 explosions in India and the UAE. Last updated on 10 October 2014 at 00:12. Then, within about 5 hours of that, Argentina were given a goal for Carlos Tevez' header when he was in the offside position.